You’ve all seen clips of great knock outs. you can see great knock outs all over the net. They are from my own personal trove of experience. but it sure qualifies for this newsletter. Back in the late sixties kicks were just coming in to their own. we mostly practiced front kicks, side kicks, wheel kicks. Then Chuck Norris came along and showed us the spinning kick. Students at dojos everywhere were trying to spin and kick. Out imagination FAR outran our abilities. it was a jump spinning rear kick. knocking down legions of bad guys. But I was trying…darn it! One day I was playing baseball with some fellows. and I was playing second base. and I waited for some situation to resolve. I began to do spinning kicks. and waited for the game to resume. I felt I had it. and collided with the ground. For a moment nobody said anything. even I could appreciate the heights of my stupidity. it involved jump spinning kicks. and kick over a regiment of bad guys. and he was pretty good. for that low hanging tree. And he was really out. before one of the guys found him. visions of spinning back kicks in his head. was push ups on two single fingers. we are talking about totally stiff index fingers. that I would never be able. I knew I could do push ups on single index fingers. on the backs of my hands. I imagined a rod of iron going along my backbone. I began doing push ups on half fists. I began reducing the number of digits. I got to the point where I could do push ups on single index knuckles. I began doing push ups on fingers. and focuses awareness in the fingers. I remember the night I got up on the single fingers. I felt like I could do anything in the world. I decided to do a couple of more push ups. But…I hadn’t reckoned on the amazing amount of fatigue. I would have been okay. But I was just charged up and ready to go. as did all of the energy it required to do those push ups. I felt right smack on my face. And I actually knocked myself out. probably a couple of minutes. that you will never hear about. That’s what happens when you go for something. and really learn the martial arts. That’s a life goal worth having. at a price you won’t believe. It’s end of the week work out day! Get all set up for working out all weekend. My first experience in resistance was a kicking bag. Kicked the crap out of it. it didn’t feel like a human body. then kicked bodies for control. but knew there was something lacking in my reality. Then they came up with kicking shields. Much better than a bag. in spite of the fact that your partner could flinch and twist. without sending him through a wall. with my fist and foot. you can feel the biceps. but you can feel with your fists. You can feel with your feet. and this includes the human body. like thumping on a watermelon to see if it’s ripe. that your opponent believes in your punch. and watch them feel the pain. But you have to be very careful. the more effect it has. your punches are going to be amazing! that allows us to practice our killing art. Time to work out ALL-L-L-L day long! Armor in the martial arts…part two? and realized I was only half done. But let me finish the article right here. and in when the body contracts. or when you are getting struck. But it is a major alignment. Just remember that you must breath as if to the tan tien. The tan tien is the energy center an inch or two below the navel. it will go to the bottom of the lungs and stop at the diaphragm. and condenses into the tan tien. and you will feel a tingle in your finger tips. and this energy can be cycled through your body. we come to the interesting part. direct energy to a body part. and you will feel a sensation in your right index finger. until you do feel the sensation. and begin to glow with energy. you learn how to breath. you become aware of the place being struck. you are directing energy into the site. then into the body part being struck. and the energy just slides through the body. Sometimes you can feel it moving. but it won’t take long if you know what I am saying here. going to where I was going to get struck. And the pain of getting struck totally stopped. and there was literally no effect. Other guys in the school just accepted this. They were going through it, too. People on the street were sort of amazed. It is not the same as taking a punch in boxing. In that discipline you tighten the muscles. the energy moving under the surface. what I should have told you yesterday. you have to work to make it work. But the Temple Karate course is better. plus a few other abilities. and I show you how to make it work. You see me do it on video. but there is usually too much degradation of form. and is about efficient as it gets. That is really going to depend on a lot of factors. all you have to do is dig in and commit yourself. and I’ll talk to you next. Hit Them Really, Really Hard! The first time I ever actually hit someone I was shocked. what it was like to hit somebody for real. and it totally changed me. I actually had to hit somebody. of what it is like to hit somebody. here’s the truth of a punch. from one body to the next. It’s not how hard you hit. or anything else like that. It’s how much weight you deliver. those other things can enter the equation. how much weight can you put on the sucker’s body? Can you put so much weight the other guy’s body breaks? Can you control the weight so it is a push and not a punch? Does air punching really work? especially once you have tried to do a real punch. I felt weight go through my wrists. went over a bed and hit the wall. I might have flown away from that guy from my own punch! that I understood what the drill was for. Assume the push up position. Go from the hands to the fists. but then land on your fists. Don’t do too many at first. and that is what it is like to hit somebody. and through the rest of the body. so you can absorb the weight. The actual weight here is going to depend on who weighs the most. then he will fly away. of Matrix Karate and the Shaolin Butterfly. The story behind it is interesting. The school is pretty good. how to teach with fewer, smaller forms. and the Houses from Matrix Karate. you can understand what I was doing. It’s one of the most important books ever written. and ties together all sorts of loose ends. people think about the martial arts. Do you know what clunking is? I made up the term. shivers the heart of the person being struck. You think I am being a little too exuberant in my description? Listen, there are three depths of strike. and one to the bone. nothing but gotcha, with no impact. Punch muscle deep and you create bruises. Little welts to purple blots. when you are playing with this strike. to strike bone deep is something else. not even bothering with the skin or muscle. there are very few bruises. as if there was pain. that the kids cry about. and if I did this to your kidneys you’d piss blood and die. but knowing that the body is going to break. how do you practice this depth of punch? I’ll give you a couple of good clues. and this leads to the second hint. at the point of impact. Can’t get more specific with any type of muscular training. concentrate on the sensation of his body. feel the touch of bone with your knuckles. Bone doesn’t like to be touched in this manner. then you will get it. and find the page on the punch. And have a downright immortal work out! Life must be understood backwards; but… it must be lived forward. Dim Mak, the Poison Hand of the Martial Arts, is death by a single touch. One of the more esoteric forms of Dim Mak is to coat the fingernail with poison. It is said that a serious assassin would coat his fingernail with wax, then apply the poison. Thus, he could scratch an opponent with a slight flick of the finger, not risk death himself, and cause death easily. Just how Deadly is the Martial Arts Poison Hand called Dim Mak? This is said to be a skill developed in certain less than honorable gung fu practices, and utilized by ninjitsu assassins. Mind you, nobody has ever given any rock solid historical examples of this type of Poison Hand Dim Mak, but that is not to say it is impossible. If the modern student happens to be a worker in a chemical factory, or perhaps have connections in the biological warfare department of the US Army, then such a thing as a poison hand dim mak is possible. It is this writer’s opinion that there is a far simpler method for developing this technique. In the saga entitled ‘Iron and Silk,’ by Mark Saltzman, a certain kung fu teacher would strike a piece of metal a couple of thousand times a day. The point is that anybody can develop the poison hand death touch if they simply train and train and train. Something that is anathematic to many of today’s ‘go for the gold’ martial artists. Many martial artists, you see, go to class, do their forms, then discuss how deadly they are over tea. The dedicated poison hand dim mak specialist isn’t going to do that…he is going to train. He is going to hit pieces of metal, or slabs of wood, or some other substance. He is going to do this softly, but insistently, and for an hour or more every day. And, he is not going to be satisfied with a couple of months, as if ‘earning a belt,’ or even a couple of years, as in ranking in another system. No, he is going to do this for years and years. Decades. And, in the end, he won’t be satisfied until the mere touch of his knuckles is enough to cause an opponent to curl up and die. Perhaps it is good that we don’t have people with the depth of personality to train in this intense manner. After all, shake hands with a poison hand dim mak specialist who has trained in this fashion…and your hand may well just curl up and die. If you want to see some real chi hung power, as in the Poison Hand Dim Mak, check out Matrixing Chi. Then put that together with The Punch. Both courses are at Monster Martial Arts. This has been a page about poison hand dim mak. Secret of the One Punch Knock Out! One of the reasons Karate waned while Mixed Martial Arts grew was that people couldn’t knock people out or even down with a Karate punch. This does not signify that Karate, or kung fu or other classical martial arts don’t work, it just means that the knowledge on how to knock a person out with one punch has been lost. The above noted, if you want to knock somebody out with one punch, it is going to take a bit of work. 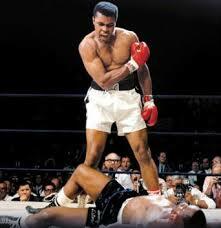 Even Mohammad Ali (Cassius Clay), relied on luck for his famous ‘phantom punch,’ which knocked out Sonny Liston. But there is a precise technology to make this stunning knock out punch work. The technology is in the martial arts, but has largely been forgotten. One Punch Knock Outs are Possible! Back when I started Karate training, in the sixties, the knock out punch was known and sought by martial arts students. They practiced the technique endlessly. And, in the non contact tournaments of the time, when accidents happened and contact was actually made, people went down. The actual physics of the punch are quite simple. First, the the punch must be a snapping punch. The student should work as hard on the retraction of the fist as the explosion outward. The reasoning behind this was that if a punch was extended and left out, if it was a thrusting punch instead of a snapping punch, the force would come back down the arm. But, if you throw a snapping punch, then the impact was left in the body, as the force didn’t have time to come back down the arm. And that’s all there was to it! Uh, almost. As simple as that sounds, it does take fanatical practice to make work, and there is one more element that a person should consider. There was an incident on a university medical campus where a student had taken a cell culture and was walking across the campus. He stumbled, dropped the culture, and it broke on the ground. All the cells in that culture, of course, died. Oddly, all the cells in the original culture also died. So cells are connected. Well, of course, anybody knows that. If somebody steps on your toe, your whole body reacts. So, if somebody hits you on the outer layer of skin, but hard enough to jar the cells themselves, the whole body is going to react. What we are talking about is depth of strike. You don’t have to hit deep, as, again, the arm will absorb part of the shock of your punch. You just have to hit right, snapping, and with the intent to leave all the trauma in the cells. And, of course, it helps if you hit a sensitive area. Hit the jaw just right, with enough snapping force, there is going to be reaction, and the body is going to crumble. Hit the testicles, or an area in which a pressure point is located, and you are going to have success…your opponent is going to go down. The problem is that people don’t trust this method unless they have trained long years in it. And, people lack the intention, the idea behind the punch, which is one of the things that long years of practice will build up in the student. Anyway, whether you study karate or kung fu or any other classical martial art, that is how you knock somebody out with one punch. And, if you don’t study the martial arts and want to knock somebody out with one punch…then maybe you should head down to check out your local karate class or kung fu class.